Brush Art of Downs, Kan., is recalling about 98,000 WIC nutrition plates. The firm has received two reports of plates catching fire while in the microwave and one report of the plate melting. No injuries have been reported. This recall involves WIC nutrition plates which illustrate the recommended distribution of the food groups. 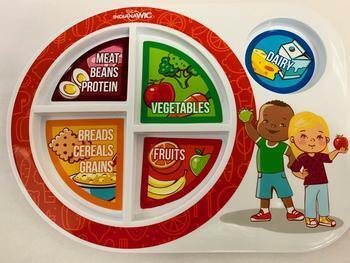 The plates contain dividers that include labels and colorful pictures showing the portion sizes for protein, grains, vegetables, fruits, and dairy. They are 12 inches long x 9 inches wide. The back of WIC Nutrition Plate has the safety label, Brush Art website and logo, date code of 7-18 and location of manufacture. Units that have an engraved stamp of ISP219 are not subject to recall. The plates, manufactured in China, were distributed as a free promotional item exclusively by WIC clinics located in Indiana from August through November 2018. Consumers may contact Brush Art at (800) 778-9005 from 8:30 a.m. to 5 p.m. (CT) Monday through Friday or online at www.brushart.com and click on “WIC Plate Recall” at the bottom of the page for more information.